Mitchell Beer is President of Smarter Shift, an Ottawa-based firm that specializes in online content generation, social media strategy and management, and energy and climate communications. Connect with Mitchell on Google+. Flexibility, collaboration, and personalization are the cornerstones of a successful digital marketing strategy, four leading marketing strategists told a May 15 webinar hosted by DNN. The panelists were responding to DNN’s recent white paper, “Marketing Got Complicated: Challenges (and Opportunities) for Marketers at Mid-Sized Companies.” The white paper reported on a February 2014 survey that captured the experience of 300 marketers in companies with 50 to 5,000 employees. The research confirmed what many of us already suspected: it’s a tough business for marketers in mid-sized companies facing a huge pool of competing content, a dizzying array of marketing platforms, and multiple priorities for scarce marketing dollars. Here are the five burning questions that panelists addressed during the webinar. 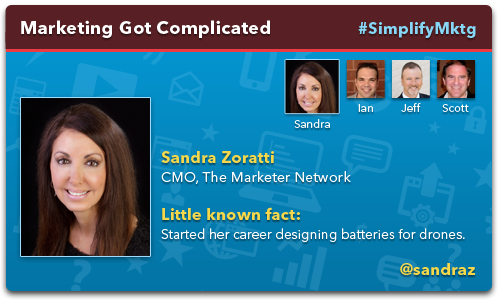 Technology marketer Sandra Zoratti (@sandraz), CMO of The Marketer Network, noted that the average adult attention span has fallen from 12 seconds to eight since 2000. “Just as a point of reference, a goldfish has an attention span of nine seconds.” To cut through the noise, she advised participants to rely on visual content, deliver scalable content, and rely on data to understand their audiences. 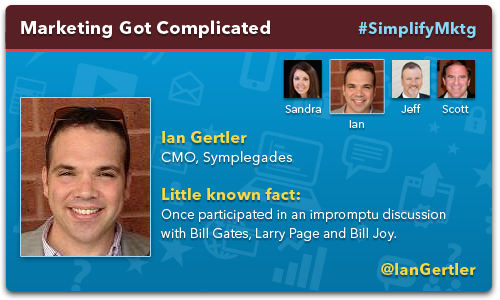 Ian Gertler (@IanGertler), CMO of Symplegades, agreed that visual storytelling is “really the evolution of how people find content,” allowing users to skim large volumes of input until they find the material they want to focus on. 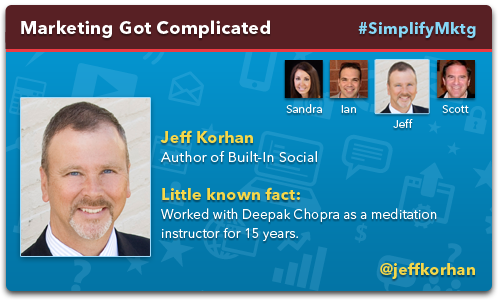 Author and marketing consultant Jeff Korhan (@jeffkorhan) said organizations can succeed by inventorying the stories they already tell in selling situations, “tightening them up, and looking for the intersection of those stories with the pain points that customers have.” The best stories “are memorable, which means they’re transportable, which means they’ll be shared on the social web,” where they’ll reach a wider audience and attract more business. DNN’s “Marketing Got Complicated” report revealed that the majority of marketers in mid-sized companies are juggling five or more marketing solutions. The panelists’ advice was to find one platform, make sure it’s the right choice, get to know it well, and build up from there. “Technology is supposed to be empowering, and it certainly has been that in a lot of ways,” Gertler said. But “it’s very important to not just collect data, which a lot of people do, but to collect it, analyse it, and then actually apply it back into the [marketing] equation.” That way, the right marketing solution helps guide business decisions and shape customer experiences. 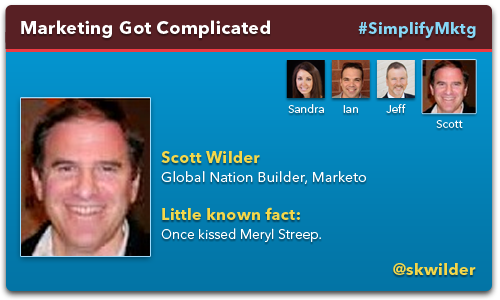 Scott Wilder, Global Nation Builder at Marketo, encouraged participants to talk to marketers in similar-sized companies that aren’t competitors, and ask about the budgets and internal resources they need to work with different products. Zoratti agreed that marketers need “solutions that are a fit for you, versus ones that boil the ocean,” and urged participants to test-drive new solutions before committing to them. Shiao pointed to the large number of marketing objectives that had received a high or very high rating from at least three-quarters of survey respondents. “When you have so many priorities as a marketer, you essentially have no priorities,” he said. Zoratti agreed that “in the tornado that is marketing today, it’s becoming really, really difficult” for companies to set a course and stick to it, but she added a priority to the list: in addition to customer acquisition and retention, increased brand awareness, new market development, and ROI measurement, she stressed the opportunity to reactivate customers who defect from a brand. Wilder said marketers should take a step back from multiple tactical goals and keep an eye on a single corporate objective. “Focus on one specific thing in terms of your goal and how you want to be evaluated, and start there,” he recommended. With 90% of survey respondents reporting that they had introduced their own online communities, or planned to by the end of 2015, Shiao asked what steps companies should take before launching. Korhan said marketers must always give online communities their absolute best and strive to personalize the experience for members of different communities and tribes. “People in those communities will be very active,” he said, and that should trigger marketers to “invite them in to be major contributors” to building the brand and attracting other community members like them. If you missed DNN’s live broadcast, you can still register to view the on-demand replay. In addition, DNN published the webinar slides, which are included below.